David Jones offers an unparalleled portfolio of local and international brands you know, love and respect. The David Jones Gift Card can be used across fashion, beauty, home, electrical and fine food of which many brands are available at no other department store. 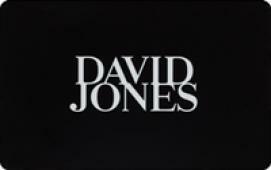 David Jones Gift Cards can be used to make purchases online at davidjones.com.au or in any of their stores located throughout Australia, and are valid for up to 24 months. eGift cards are treated as cash and cannot be replaced if lost or stolen. eGift Cards may only be used for purchases in David Jones stores and cannot be returned or exchanged for cash or used to pay any David Jones branded Credit Card account or other Credit Card accounts. The funds available can be verified on request or at time of purchase at any point of sale in a David Jones store or online at davidjones.com.au. No change is given and any balance that remains on the card can be used in whole or part against future purchases at David Jones. Any balance that remains on the eGift Card after expiry will not be available for use. For full terms and conditions visit davidjones.com.au/giftcardtermsandconditions.